The artefacts were discovered in Leek last Christmas. They were reported Treasure via the British Museum's Portable Antiquities Scheme based at Birmingham Museum. Archaeologists from the city council and Staffordshire County Council supported site investigations on the land. They were carefully examined by experts at the British Museum and declared treasure at an inquest hearing in February. The torcs were put before the national independent Treasure Valuation Committee, where a panel of experts had the difficult task of putting a value on ancient items never before seen in this country. Donations from members of the public and major support from funding bodies as well as trusts and local businesses have been flooding in since the campaign was launched in September. The city council, in partnership with the Friends of the Potteries Museum & Art Gallery – which was leading the public fundraising campaign on behalf of the museum – had until 5 January to meet the valuation price, or risk the artefacts potentially being separated out and sold to private bidders. Chairman of the Friends of the Potteries Museum & Art Gallery, Ian Lawley, said: “It is excellent news that the final piece of the funding jigsaw has fallen into place. The campaign to save these beautiful objects caught the imagination of the public and we would like to thank everyone who contributed to the appeal. Councillor Anthony Munday, the city council’s cabinet member for greener city, development and leisure, said: “We are so grateful to the National Heritage Memorial Fund and to Art Fund for helping us to make this fundraising campaign a success. 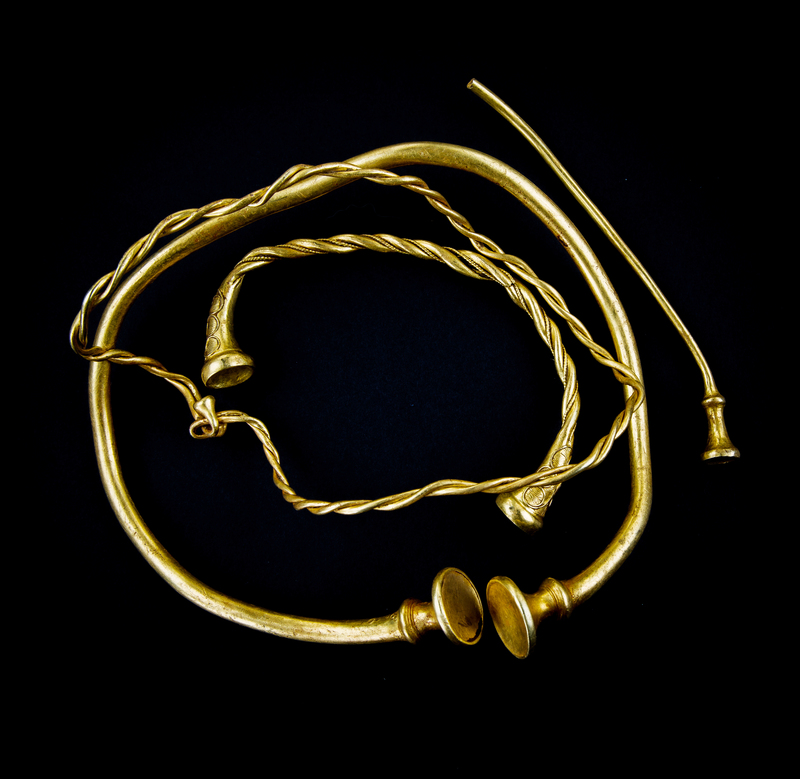 Julia Farley, British and European Iron Age curator, British Museum, said: “Learning about the discovery of the torcs last year was like an unexpected early Christmas present. This year’s news is even better. “I am beyond delighted to learn that funds have been raised for the Potteries Museum & Art Gallery to acquire this incredible find. This fabulous gold jewellery is of international importance, shedding new light on the relationship between Britain and Europe over 2000 years ago. We are using the hashtag #leekgold for all social media posts related to the campaign, if you could do the same please. The four gold artefacts are currently on temporary display at the British Museum, but hi res photographs of them are available on request. Under the Treasure Act (www.finds.org.uk/treasure) finders have a legal obligation to report all finds of potential Treasure to the local coroner in the district in which the find was made. The success of the Act is only possible through the work of the Portable Antiquities Scheme, advising finders of their legal obligations, providing advice on the process and writing reports for coroners on Treasure finds. The Act allows a national or local museum to acquire Treasure finds for public benefit. If this happens a reward is paid, which is (normally) shared equally between the finder and landowner. Interested parties may wish to waive their right to a reward, enabling museums to acquire finds at reduced or no cost. Rewards are fixed at the full market value of the finds, determined by the Secretary of State upon the advice of an independent panel of experts, known as the Treasure Valuation Committee. The administration of the Treasure process is undertaken at the British Museum. This work involves the preparation of Treasure cases for coroners’ inquests, providing the secretariat for the Treasure Valuation Committee, and handling disclaimed cases and the payment of rewards. For all media enquiries please contact Laura Webster in the Communications Department at Stoke-on-Trent City Council on 01782 232265.